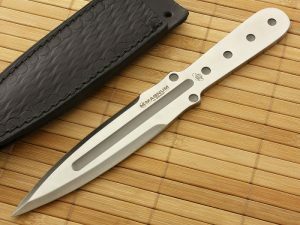 If you are tired of going through all of the e-commerce sites and want to find the best throwing knives then you've come to the right place. Throwing knives is a fantastic recreation that the Throw Ninja Star family enjoys along with throwing stars. Few things are as satisfying as sticking a perfectly thrown knife right in the bullseye. There are a staggering amount of options that we have narrowed down to four different options that we would classify as the best throwing knives for each of their intended uses. This is a question often asked and its not easy to answer what is the best professional throwing knives or tournament grade throwing knives? 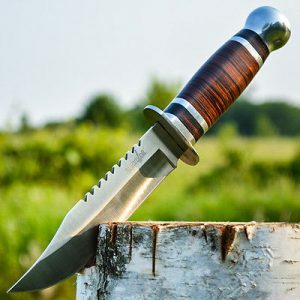 A professional throwing knife is a subjective term, and you'll frequently find professionals using hand made blades as well as the whole gamut of off the shelf knifes. 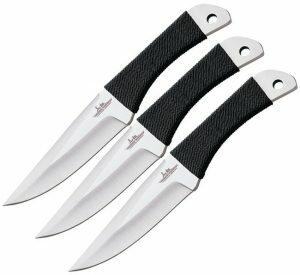 For our tastes you will do very well by this set of professional throwing knives by Böker called the Magnum Bailey Ziel 2 that come in a set of 3. It is a well balanced knife suitable for throwing either from the handle with a hammer grip or from the blade. Each knife weighs in at 14 ounces with a length of 13 1/4. They are made from 420J2 stainless steel and come with a genuine beautiful leather sheath. These will meet most any knife throwing tournament guidelines including the American Knife Throwers Alliance rules. These are fantastic knives that can last you a lifetime of throwing. If you are only going to buy one set, this would be our recommendation. At the time of this post they sell for $68.50 available at Amazon. If you are a looking for dual purpose knives that can be thrown as well as used around camp or in the field then you might be in the market for tactical throwing knives. There are a few good options in this class but our favorite is made by Cold Steel, its the G.I. Tanto. This is an incredible beast of a knife that makes a decent thrower and a great general duty knife. It comes with a Secure-Ex sheath that you can wear a variety of ways. On top of that you easily adapt this knife as a spear point if you and Wilson are stuck on a desert island. Its 12 in length and comes in at 10.6 ounces. The blade is made from 1055 carbon and holds an edge and sharpens extremely well. This is a great knife as are most Cold Steel products, we found this one for $20.74 at Amazon. Note: comes as a single knife not a set of 3. You don't have to go broke to find some decent cheap throwing knives. What you'll have to sacrifice is the quality of steel and longer term durability of the knives. You have a quite a few options under $20 for a set of 3 which is what we set our benchmark at but we think you'll agree that the Gil Hibben Cord Grip Triple Throwers are an excellent option. They are approximately 8 and 5/8 long about 3/16 thick and weigh roughly 5.5 ounces. At the time of this original post they are going for $18.85 which we think is a screaming deal for a set of three and genuinely make a great set of throwers. This is an excellent starter set, our only complaint is that the cord wrap can easily be frayed or cut by several blades coming into close proximity with each other. Other than that these are nice big hefty throwing knives perfect for starting your knife throwing career. Buy yours at Amazon among other knife retailers. Its a story as old as time, you find yourself fighting for your life in a post apocalyptic teenage romance drama and you think to yourself if I only had one throwing knife what would I choose? The answer to that is surprisingly easy, you go with the Boker Magnum Bailey Throwing Knife Set. If you watch closely (and believe us we have!) for the knife scenes in the Hunger games you'll note that this is indeed the very knife that Clove holds to Katniss neck. Why didn't she just end it there you ask? Because she wanted to throw it of course! Although with these they hold a nice edge as well so if you are forced to go to a knife duel you'll be fine. On top of that they are just plain wicked looking. The design is very striking but they throw remarkably well. If you look closely on the blade they are labeled as the mini bo-kri designed by John Bailey. John Bailey is an amazing knife thrower and for many years has been Bokers chief knife designer. 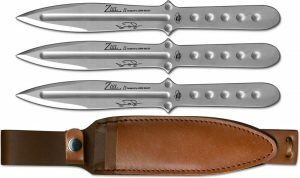 He also designed the Ziel 2 which we recommend as the best professional throwing knife. These knifes are made out of 420J2 stainless steel and are 10 7/8 long. They weigh 11 and a half ounces each and come in a set of 3 with a nice leather sheath. These are indeed serious knives. At the time of writing they sell for $34 for a set of 3 at Amazon. As holds true in most things buy the most knife you can afford. This isn't a gimmick to get you to spend more money, you'll be rewarded with knives that throw well, are balanced correctly and will give you much better success than cheaper dime a dozen knives. Any of our four knives above will make excellent choices for beginner knife throwers as well as seasoned professionals. A well balanced knife with a good length will let you throw via the blade or the handle and a general rule of thumb is approximately 1 ounce of weight for every inch of length. A common mistake is buying a knife that is too light or too short. And if you've made it this far and are saying I still don't know which ones to purchase! Just go with the Magnum Bailey Ziel 2 you wont be sorry. If you're still exploring throwing options there's always throwing stars. Head on over to our guide which goes into great detail on a variety of throwing star options.